Hi everybody! I’m so excited to introduce you to a Korean dessert (or snack) called gotgamssam. 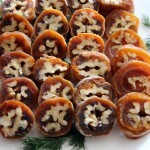 You need only 2 ingredients: gotgam (dried persimmons) and hodu (walnuts)! I think this is a record for the fewest requirements needed to make one of my recipes. If someone asks me what else they need, I would say “strong fingers,” because you’re going to need to squeeze the wraps tightly to press the walnuts into the soft persimmons. Dried persimmons are delicious by themselves, but if you feel like making a special dessert or snack for yourself or your guests without spending too much time preparing them, gotgamssam will be a perfect choice. For your guests, serve a few slices of gotgamssam with tea. They will be very impressed! And it will also be a good idea for a gift. Fill a small box with gotgamssam! 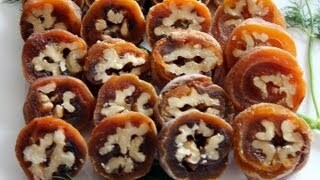 The heart-shaped dried persimmons that I use in this video are sold at a Korean grocery store. The persimmons should be semi-dried so that you can wrap walnuts in them easily. If the dried persimmons are too dry, put some honey inside of them to make them sticky. The other type of dried persimmons that I use in this video that look like flat, round discs are sold at an Asian grocery store. You can make gotgamssam with either one. If you like persimmons, check out my dessert persimmon punch (“Sujeonggwa“) recipe. Slice open the persimmons by slitting the sides. Make sure not to cut them all the way through. Open them up and remove the seeds. Flatten them out and trim the edges to make rectangular strips. Put them side by side with sticky part up. Add 3 halved walnuts lengthwise, with the wrinkly part down. Add 3 more halved walnuts to fit on the first like lids. Roll up the persimmon. Cover with plastic wrap and press it together. Keep in the freezer. Serve with tea and slice the wraps into ⅓ inch thick pieces. Make 3-4 strips of apricot. Put them side by side on your cutting board with sticky part up. Add walnuts and roll them up the same way you would do for gotgamssam. Posted on Tuesday, March 27th, 2012 at 7:03 pm. Last updated on April 26, 2015. Posted January 9th, 2013 at 12:33 pm | Log in to reply. I am really intrigued by this recipe. I have been buying frozen persimmons at a local grocery chain that features a lot of healthy and interesting products. Do you think this would work if I bought those frozen persimmons and just thawed them out and let them get soft again? The persimmons have a really unusual flavor that I find really appealing. Have not found another fruit that is quite like it! Posted June 14th, 2012 at 2:59 am | Log in to reply. Posted April 4th, 2012 at 2:10 pm | Log in to reply. This recipe is perfect! 2 ingredients, simple, healthy– a great alternative to sugary sweets for my daughter (and for me, too!). How long do they keep? If I make them on the weekend will they keep in the refrigerator or freezer through the week? Thanks! Posted April 5th, 2012 at 5:01 am | Log in to reply. yeah only 2 ingredients and no cooking. : ) You can keep it in the freezer up to a few months. Posted April 16th, 2012 at 5:37 am | Log in to reply. 감사 함니다. I brought these to work and now my coworkers are hooked! Posted April 16th, 2012 at 11:30 am | Log in to reply. Posted April 3rd, 2012 at 2:53 am | Log in to reply. Posted April 5th, 2012 at 4:55 am | Log in to reply. Posted April 1st, 2012 at 6:11 am | Log in to reply. Posted April 1st, 2012 at 9:17 am | Log in to reply. Posted March 28th, 2012 at 9:58 pm | Log in to reply. Posted March 29th, 2012 at 8:46 am | Log in to reply. You can invent your own gotgamssam by adding some of your favorite ingredients. Posted March 28th, 2012 at 9:47 am | Log in to reply. Posted March 29th, 2012 at 8:47 am | Log in to reply. Marise! : ) You must be a really good daughter to your mom! Posted March 27th, 2012 at 10:42 pm | Log in to reply. This recipe was originally posted on March 27, 2012 at 7:03 pm by Maangchi. It was last updated on April 26, 2015. The video was watched 248,164 times on YouTube & has 2,986 likes!